The end of this fall trip is approaching, and I’m back in the Connecticut River, spending a few days each in various favorite spots. One of these is in back of Goose Island, a little north of the I-95 bridge in the town of Old Lyme. 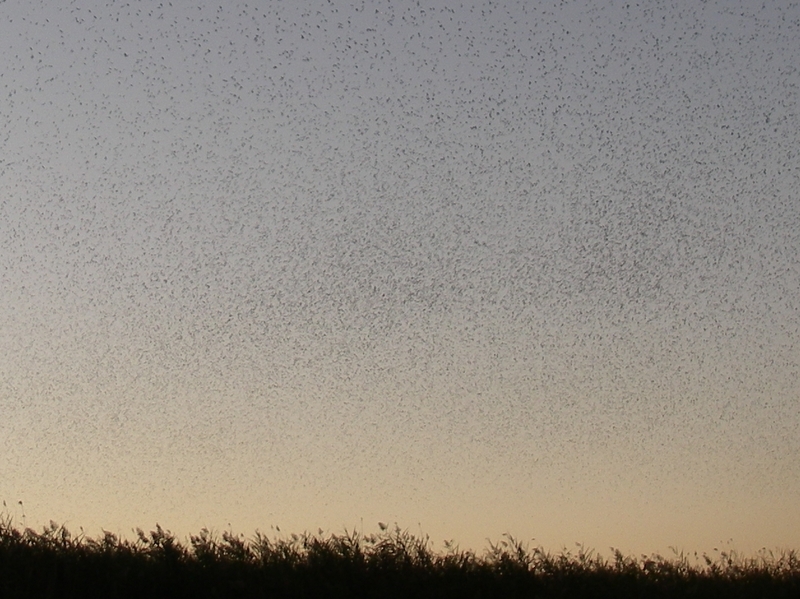 Every night, for a bunch of September and some of October, Goose Island, which is completely flat and entirely covered in reeds, is the gathering place for thousands and thousands of migrating tree swallows. This would be extraordinary in itself, but it’s more than that. Each evening, as they get ready to settle for the night, the birds fly in, according to some reports from as far as 30 miles away. 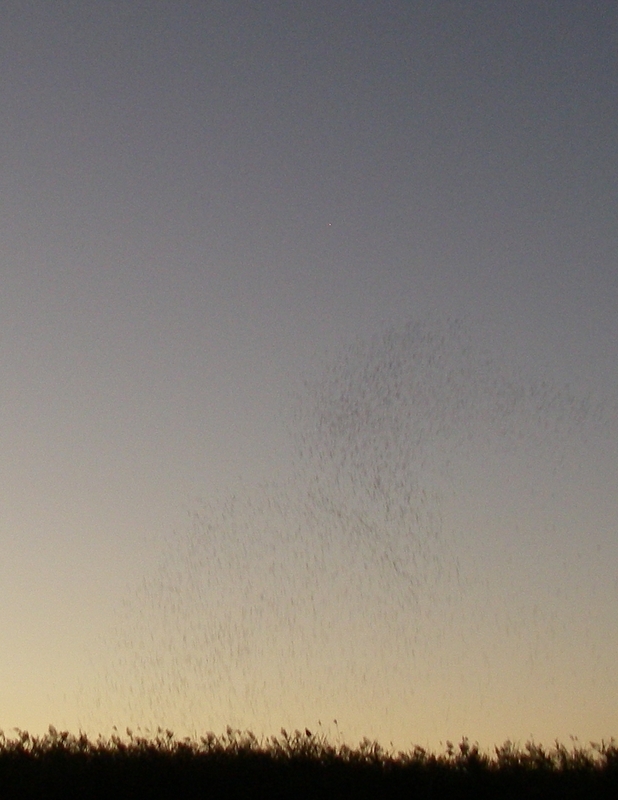 At first they all fly around in a loose, meandering group, gradually expanding in number as the sun approaches the horizon. Quite a few birds come from the north, roughly following the river. Anchored upstream, you can see them go by in various small groups as evening approaches, and at Goose Island itself the numbers gradually grow, until the sky over the island is completely thick with birds. This event is rather well-known in the area, and as the birds approach, so do the people. 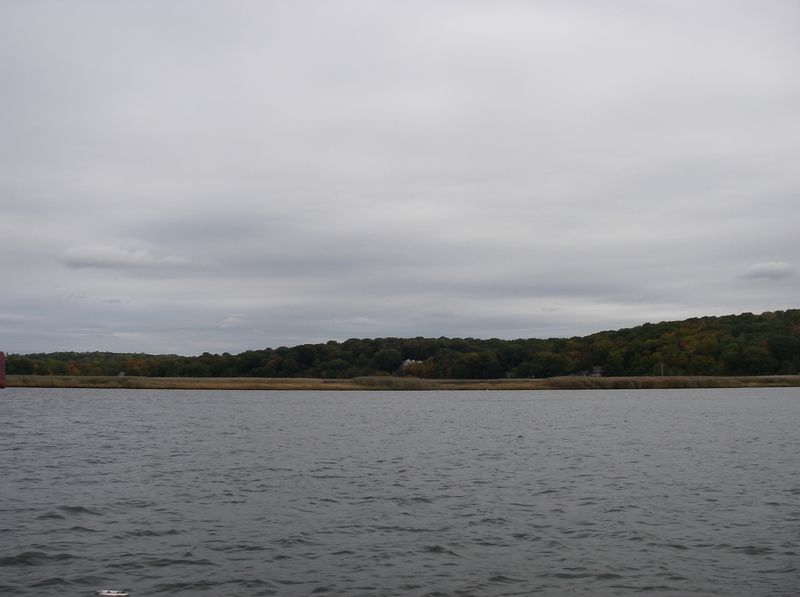 Kayaks, small motorboats, and sometimes a larger boat find their way up the creek in back of the island. On the main river, on the other side of the island, a tour boat routinely brings larger groups, and motorboats can be heard beyond the tall reeds. Most folks come by some sort of water-craft, because there is no public access to the nearby shore. This shore is lined with upscale homes, also with people on the lookout for the evening birds. And it’s clear that the occupants of those homes are inviting their friends: sounds of cocktail parties, and gatherings of 10 or 15 people at the private dock/boat ramp on the shore are often seen, especially on a pretty weekend evening. Going in to that creek for the birds involves some fascinating people-watching along with the wildlife. According to reports on the Internet, estimates are that there are as many as 300,000 birds in these evening gatherings, and I believe it. Looking up into the full group is like watching snow, when it falls in giant flakes, and you look toward the clouds and the three-dimensionality of the endless flakes above you gives a completely different perspective to the air overhead. The birds are like that – black flecks, near and farther up, and farther again, all moving, like snowflakes coming down in a swirling breeze. 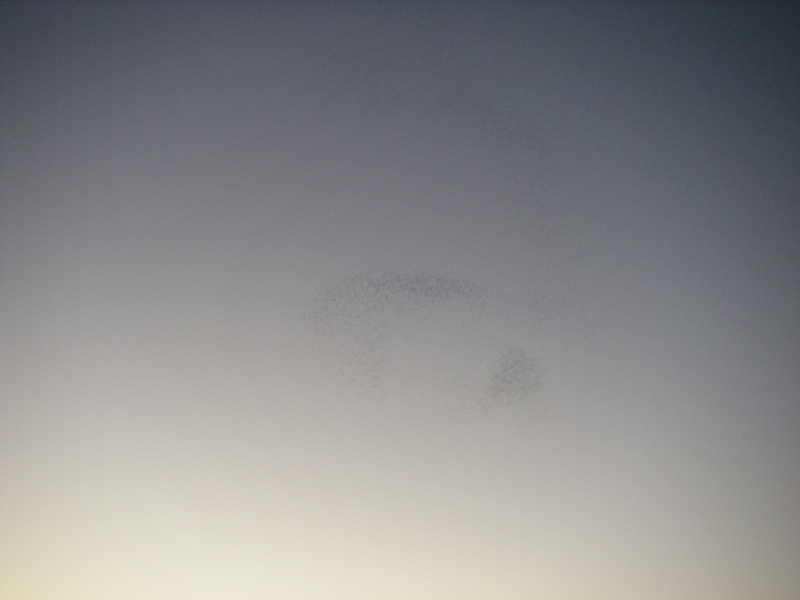 At some point, the timing of which seems to vary from one evening to the next, the birds begin to shift from flying in a loose, vaguely defined cloud, to moving together, flowing in swirls and patterns. They bunch more closely, with sharply defined edges to their individual flocks. They wheel and turn, flowing up and down, to the side, shimmering in something that recalls the movements of the northern lights. It can take your breath away, and people on shore, and in their boats, can be heard exclaiming at the best of the self-choreographed patterns. Apparently the scientists have something to say about gathering for self protection, and all that, but to me it looks like moving energy. Not a coincidence, the similarity to the patterns of northern lights – what if the birds are following shapes in the electromagnetic fields that are all around us? Or other energetic pathways not so clearly defined by science? It feels like a cosmic gift, the opportunity to witness this extraordinary display. Sometimes they seem done, and then they begin again, tightly organized and flowing, shimmering, this way and that. As the daylight starts to go, what the birds are up to changes again. 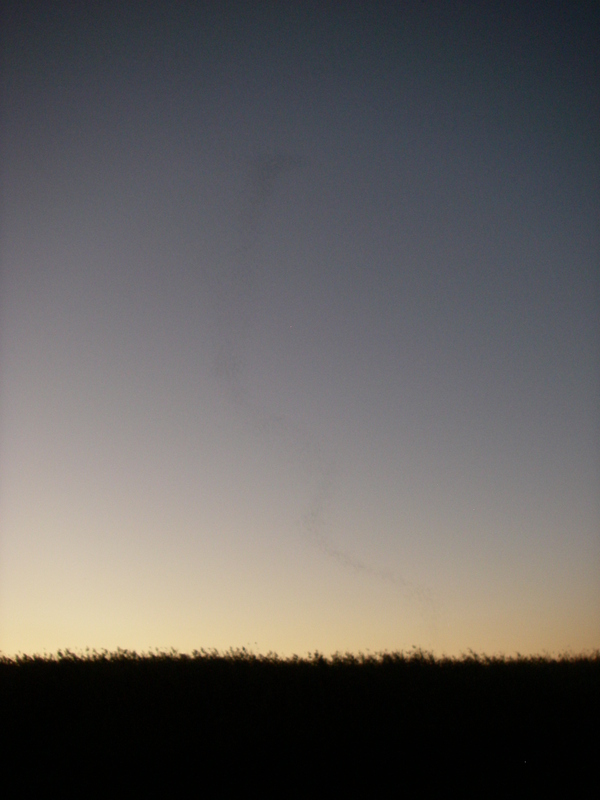 Some nights sooner, and others later, but very near to when the sun is below the horizon and it’s becoming hard to see, the swallows start to drop. Sometimes it’s like rain: the thick, dark cloud is above, and it seems like the birds relax their wings, or something, because they simply fall. Straight down, directly into the island reeds. In droves. There is the most amazing rustle, a whooshing sound, as thousands of birds drop, and disappear into the reeds. I’d love to see how they all fit in there, once landed. Other times, it’s like a tornado. Rather than dropping like rain, the birds funnel themselves into one tiny section of the larger island, a couple hundred yards square of what must be a good 10 acres or so of island reeds overall. From their cloud in the sky, the birds swirl down, creating a spiral path, pouring themselves out of the air, to the ground. Again the rustle, which I originally thought was the sound of birds in the leaves of the dry reeds. But witnessing this repeatedly, it became clear that the rustle happened before birds reached plants. Something to do, I guess, with how they relax their wings to drop in that way, and the wind brushes through their feathers. One hopes for no trains, or passing boat engines, to obscure that sound. In 56 years on the planet, I’ve never heard anything like it. It’s special, to hear a completely new sound – and even better, a sound that comes with such a magical activity. Earlier in the evening, the blackbirds come – in nothing like the same numbers, but in tight, choreographed groups, that suddenly settle onto the island. They make that noise too, and again, somehow, in the morning when they leave. The blackbirds seem to like to start their day in groups, the same way that they finish it. The tree swallows, on the other hand, slip away with no fanfare. I’ve tried and tried to see that many thousands of birds come back up from the reeds. A group here, or there, but nothing that would account for the clouds that descend in the evening. Maybe they slip out low to the river, on the other side of the island – one day I’ll anchor over there, if there’s not too much traffic, and see what I can see. As it is, I had the opportunity to witness this miracle six times. Three in a stopover for days on the way south down the river, and then when I was in that creek again for three nights this past week. Now about 5 miles farther north, getting the boat collected for haul-out in Deep River, I watch in the evening as swallow-groups fly south, cutting across the land at the bend in the river. I know where they’re going, and hold that extraordinary image in my mind, swirling birds, dropping like rain. What an extraordinary event, and beautifully described by you, Shemaya. Thanks for sharing this experience.